In November 2003 Christopher and Lesleigh Bennett purchased the property at 620 Pulaski Street. The property was formerly an A&P grocery store, Red Fox grocery store, advanced eye care, and Kingdom Life Ministries. The property had been let go and was an eyesore for downtown Lincoln. An architectural rendering of Bennett Funeral Home at 620 Pulaski Street in 2004. The building was completed in April 2004. Open House for Bennett Funeral Home was April 24th 2004. The turn out was excellent for the open house. 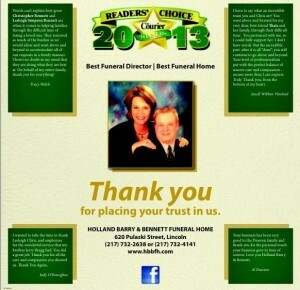 One year after opening, we got the opportunity to purchase Holland and Barry Funeral Home located at 325 Pekin Street. We completed the purchase in May 2005. We ran the two funeral homes independently for one year. In May 2006 we moved all of the files to our newest location, Bennett Funeral Home. All of our families met at our new building and had the choice to use either facility. When given the choice, over a 6 month period of time, only two families chose to use the building at 325 Pekin Street. With the small amount of interest in the building at 325 Pekin Street, we made the decision to combine the two funeral homes into the present day Holland Barry and Bennett Funeral Home located at 620 Pulaski Street.